Buriano is a small village located on the Montalbano hills. An enchanting countryside surrounds this charming village with its olive-trees and vineyards. Buriano dates from the Roman empire and its name probably descends from the Latin name "Burria", an important, aristocratic family that had a Villa and many possessions in this area. During the VI and the VII century D.C. the Longobards dominated Buriano and since they were hated from the native conquered populations, they built a fort with two towers made of squared stones in order to defend themselves. The fort and the two towers are still recognizable in the structure of the San Michele Church. 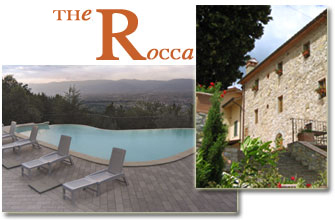 In the "Rocca del Maestrino", we wanted that the antiquity and the beauty of the existent building, made completely with stones, was respected and all the modifications have been done in the complete respect of the primal structure.